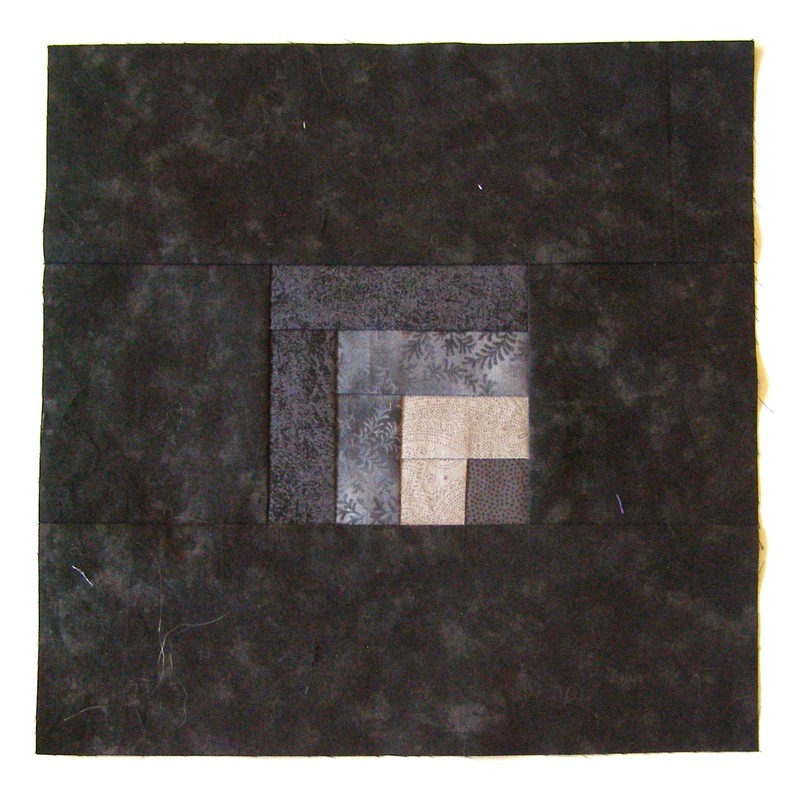 The Log Cabin Quilt Block is a very common block in traditional quilting. Traditional Log Cabin Quilts are typically sewn with a red center square and alternating sides of light and dark as in this example from the TLC Home Website. 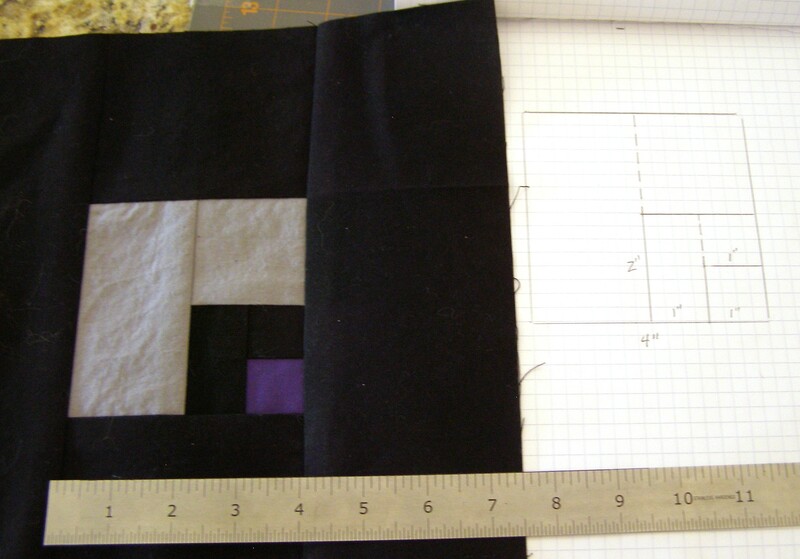 The MMQ Log Cabin Variation 1 Block is actually a 1/4 of a Log Cabin Quilt Block. 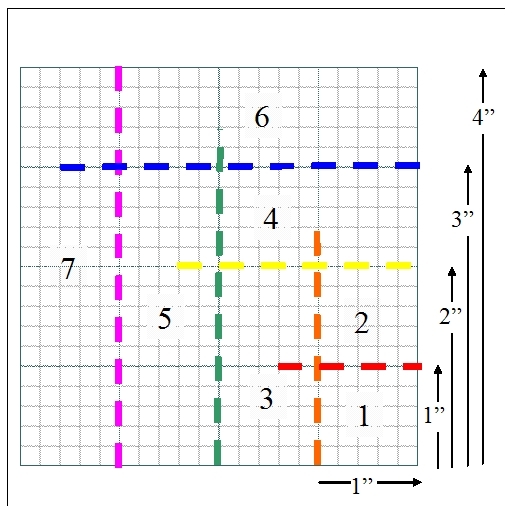 The Paper Piecing Diagram illustrates that the design starts with the lower left 1″ square and then 1″ strips are layered on the top and one side to form the “logs”. The colors of the rainbow are used to identify the order for sewing the seams (Red, Orange, Yellow, Green, Blue, Indigo, Violet). – I have to add this – the greys of the quilt are causing color deprivation! Leftover pieces from trimming the borders of the earlier blocks can be used for these blocks as the pieces are quite small. Verifying location of Piece 1 by holding up to window. 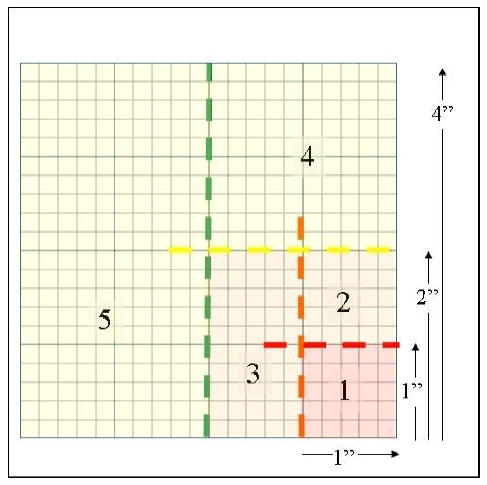 The location of Piece 1 is window checked to verify that it is correctly located. The finished Piece 1 will only be a 1″ square – but it starts much larger. The Red Seam is quite short (1″). It will help maintain a precise square if the seam is extended approximately 1/2″ beyond the Orange and border seams. Flip and press Piece 2 open. Trim the seam allowance under Piece 2 prior to sewing Orange Seam to attach Piece 3. Log Cabin Block, basted, trimmed and ready for border. 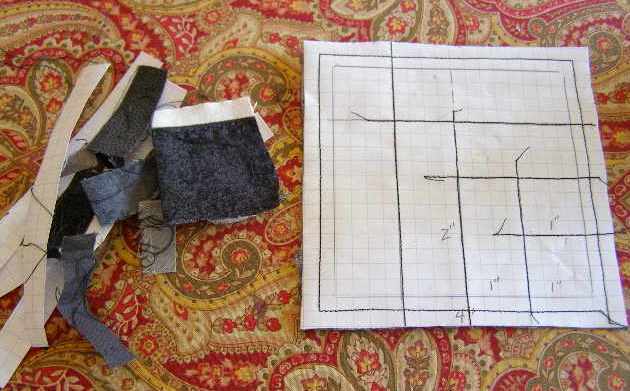 Because of the small size of the pieces, seam allowances should be trimmed after sewing each seam. This block has more seams (6 so far) than any of the other blocks thus far, but it is quite simple. 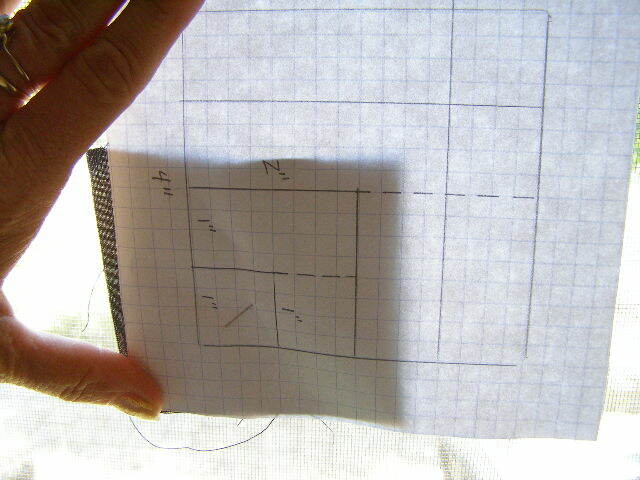 Machine baste 1/4″ (one graph paper square) from border seam and trim 1/2″ (two graph paper squares) from border seam. Attach borders, square and another block complete! 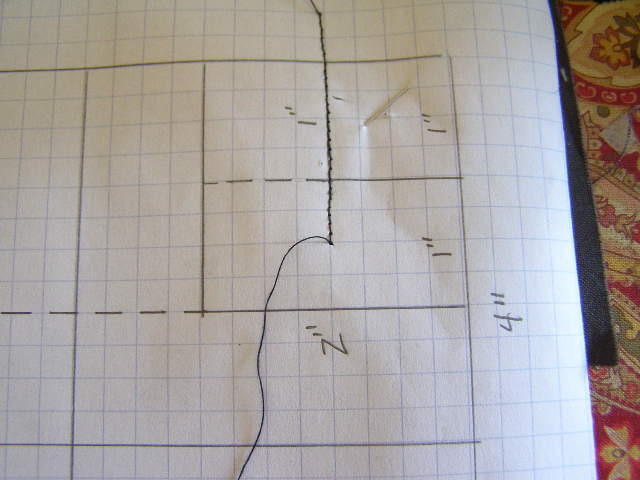 Love the ease of measurement – and precision – of using graph paper! MMQ Log Cabin Variation 2 is sewn in the same manner as Variation 1 – the only exception is that Pieces 4 and 5 are 2″ wide (eliminating the need for Pieces 6 and 7). I admit my weakness! I had to use color! Log Cabin Variation 2 – Purple square and all! When complete, this quilt will be gifted to my son, who is now 30. But as any mother can attest, 30, 40, or 50 years old – we remember our children as children. As a child, he loved purple…so a 1″ square of purple was included. Although each of the “logs” can be sewn in different fabric, both MMQ Log Cabin Variations were sewn so that both logs of each layer was constructed of the same fabric. I have to say, Variation 2 with its tiny purple square is my favorite block thus far! This entry was posted in Beginner Sewing Projects, Home Decor, Modern, Quilting, Sewing, Sewing for a Teenager, Stash Couture, Tutorial and tagged Beginner Sewing Projects, How to sew Modern Quilt, monochromatic quilt. Bookmark the permalink.